We watched in awe as Al Jazeera helped to topple a dictator in Egypt. Chartbeat was behind the scenes powering the analytics and dealing with the flood as millions came to the sites to watch a regime crumble. It was awesome to watch and we thought it would be awesome to share, so with the kind permission of Mohamed Nanabhay, we present the 2011 Egyptian Revolution in online traffic. Click on the image for the full view. 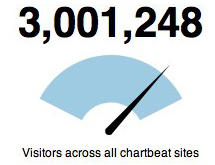 It feels like less than a month ago we were celebrating crossing 2 million concurrent visitors on chartbeat sites; that’s because it was! It took us 16 months to get to 1 million, five months to get to 2 million and now less than a month to break 3 million. Safe to say it’s the fastest growth we’ve ever seen at chartbeat. We’ve seen a flood of new sites and users over the last month but what put us over the top was the incredible events happening in Egypt. We’ve been working hard with Al Jazeera throughout what I guess we can now call a revolution. In a recent MediaWeek article, Mohamed Nanabhay talked a little about how he used chartbeat to react swiftly to what was going on in Egypt and we’ve watched in awe as a News service ignored by many of the major cable companies has become, at least for a while, the most important news site in the world. Congratulations to Mohamed and his team, and all the other news services whose reporters have been covering these events. We’re proud to have worked with you during this momentous time!